Have you ever wondered whether you could act on stage? It might seem a daunting prospect, but you might be surprised by what you can achieve and what fun it is. There are many reasons to join us. Maybe you'd like a change from the routine of your day-job and you'd like to get out of the house rather than watch TV or spend your time on social media sites. We can offer a pastime that is challenging and exhilarating, with lots of teamwork and friendship. Or maybe you're a budding actor or a professional, or a student of drama or stagecraft, or simply want to meet new people and socialise. But you don't need to sign up immediately and pay a membership fee. Come and watch our productions and rehearsals, and see what sort of things you'd enjoy doing. Read for a part in a forthcoming production or come along to the casting reading and just watch. As with many amateur drama groups, we always need more young and middle aged men, in particular, to fill the acting roles. The roles are interchangeable and if you act on stage you may feel like getting involved in some of the other roles as well. No previous experience is necessary. So, if you think you would like to become involved in any of these aspects - and more - please come to our play readings or rehearsals, or contact us for more information. In reality, most of our members have full time jobs or full time responsibilities outside Pinner Players, so it is important to understand the commitment involved - in particular in being a cast member, which may mean rehearsals twice a week for some. Below are some video clips which show the various stages that took place in our production in 2012, Entertaining Angels. We cast in September, November and February. Casting is always based on who is right for the part - whether they are a member or not. 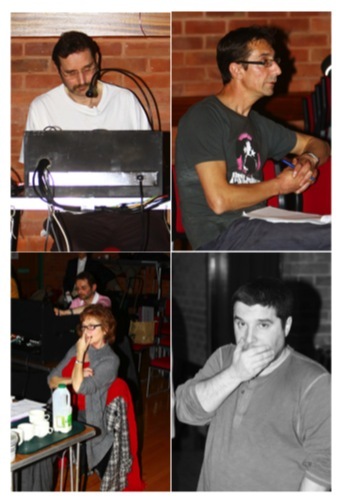 Casting readings take place in Pinner Village Hall from 8pm. Our next casting reading will be shown on our home page, in November, February and May. We rehearse every Tuesday and Friday at Pinner Village Hall from 8pm through until 10.30pm. There is also a fully licensed bar so please come along to any rehearsal and watch or simply enjoy a drink with the cast and crew. We stage three productions in a year - in February, May and November - and there is so much to do and enjoy off the stage. The set build is a a particularly busy time and we always need creative - and handy - people to get involved!